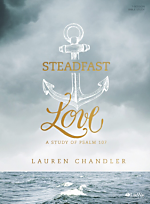 Steadfast Love: Learn to Trust Jesus in Each Season of Life (Psalm 107) – Join women from our church & community once a month for a 7-session study in Psalm 107 focusing on what our “anchors” in life are. Jesus is the only anchor you can trust! The women will gather for a meal at 6:30 and the study and prayer time will end by 8:30. Contact the church office to RSVP.